Hello everyone!! For someone that just complained that time felt as if it had slowed down lately, this week is flying by. Today I have a card for you that I made for this week's challenge over on the CAS on Sunday Challenge Blog. This is Challenge #106 and you have to use a stencil for the challenge. Hmmmm....this will be easy considering I must own over 500 stencils. But then my brain took a detour. 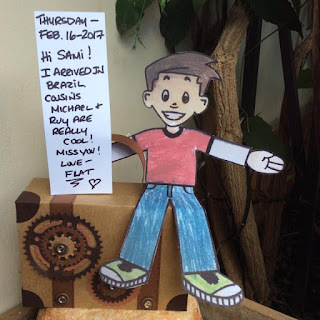 Because Brasil's version of Valentine's Day is coming up in June, I had a die and stamp set sitting on my work station that I had wanted to use. And, while looking at the die, an idea popped into my head. This die would be a great stencil. So....why not make one to use on the card? I started with the Hugs & Kisses Cover Up die by Die-namics, which, it seems, has been retired by MFT!! Grrrrr.... So I cut a piece of white cardstock and ran the die through my Big Shot to create a "stencil". I cut another piece of white cardstock with stitched rectangle from Bundle of Stitched Shapes (Simon Says Stamp). I placed the "stencil" I made over the stitched rectangle and, using an applicator, applied some Spun Sugar, Mustard Seed, and Picked Raspberry Distress Inks through the "stencil". Next, using stamps from BB Hog Heaven set (My Favorite Things), I stamped one of the phrases on the card front. I then cut a piece of white fun foam, adhered it to the cardstock and then adhered them both to the card front. Next I stamped and die cut the fence and one of the pigs and colored them with Copic markers (RV21, R00, E13, E33, and G07). I glued the fence to the card front above the phrase and then adhered the pig head above the fence with pop dots so it looks 3D. Hello...hello....hello.....I hope everyone is doing great so far this week! 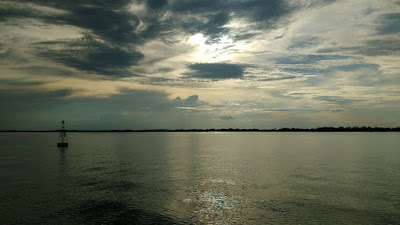 There are so many "holidays" here this month, with long weekends, that time feels like it has slowed down. 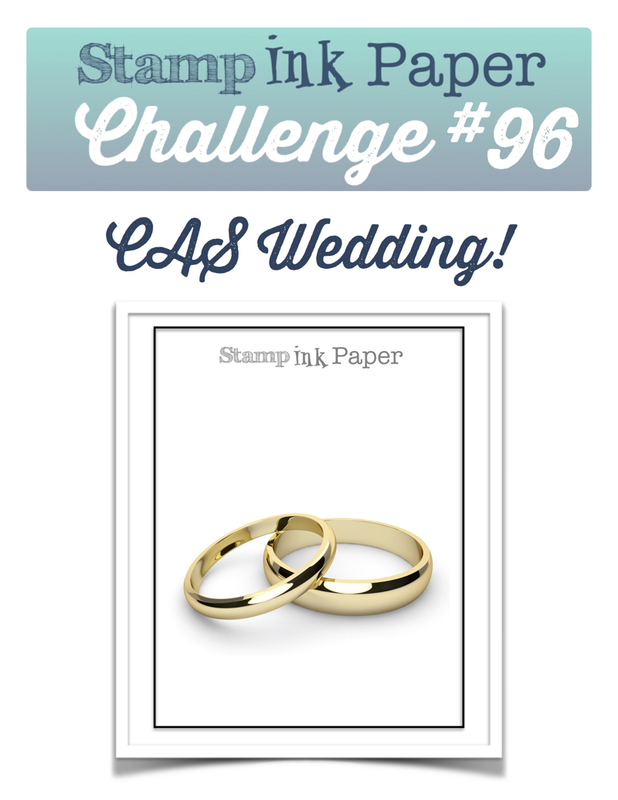 Today I want to share with you guys a super easy CAS (clean & simple) wedding card I made for this week's challenge over on the Stamp Ink Paper Challenge Blog. 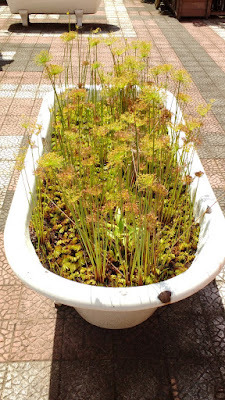 I swear...you can make this in less than 10 minutes! I started with a top folding A2 card base of white cardstock. I then went through my stash and found a really classy metallic designer paper (from Brasil), which I adhered to the card front. Then I cut another piece of white cardstock using the large stitched rectangle from the Bundle of Stitched Shapes (Simon Says Stamp). Strangely, I do not own many images for a wedding. That is going to have to change soon. LOL But I do have this beautiful and classy set called "Always And Forever" by Gina K. Designs. Sadly, it's retired. I placed the cardstock in my Misti and, using Versafine Onyx Black ink, stamped the image and phrase several times until I got a nice black image. I then cut a piece of white fun foam, which I adhered to the back of the cardstock, and then I adhered this to the card front, centered on the metallic paper. Last thing was to adhere some silver sequins. Hello everyone. I hope y'all had a great weekend!! 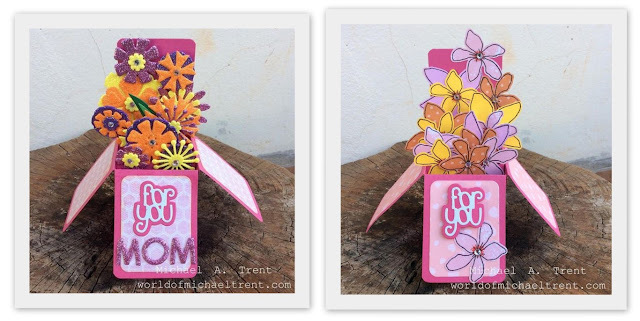 I had fun making two Card In A Box cards for a class I might be giving here. The first one (on the left) I made using glittered fun foam, which came out great but the glue took too long to dry. The other one (on the right) I made using Floral and Flutter stamps by Concord & 9th and cardstock. Much easier to make and love how this one came out. I'd love to know which one you like better. I made today's card for the Less Is More Challenge Blog. 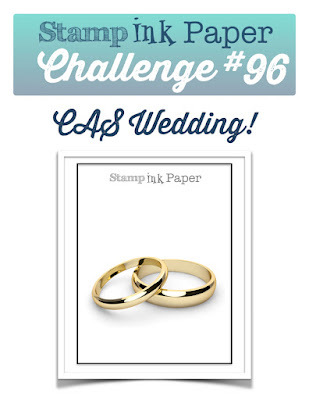 This week's challenge #325 is to use a stripe on the card. As soon as I saw the word "stripe", stars and stripes popped into my head, and I knew the perfect image to use - "stars and stripes FOREVER" by Unity Stamp Co. I started with a top folding A2 card base of white cardstock. Then, using the long stitched rectangle die from Die-namics Blueprints 1, I cut a piece of red, white, and blue cardstock. I adhered a piece of double sided tape to the back of each of them and adhered the "stripes" across the top. Red, White, and then Blue. After I trimmed the edges with a craft knife, I stamped the image from "stars & stripes FOREVER" with black ink on to a piece of white cardstock, which I then colored with some Bic markers and then trimmed the image. I stamped the phrase, adhered some pop dots under the image and applied it to the front of the card. The last step was to apply some red, crystal, and blue stickles to the areas on the sides of the image. Done! 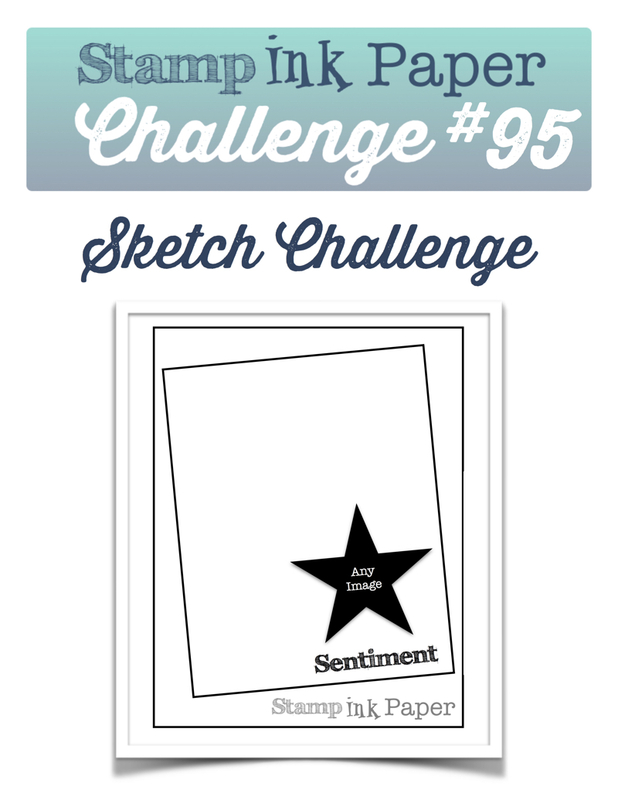 Labels: July 4th, Less Is More Challenge Blog, Unity Stamp Co. The video seems to be too large for blogger so you will have to click HERE to be taken to the video on You Tube. Below is a photo of what the cacao fruit looks like. If you want to learn more about cacao check out THIS video. Cacao - where chocolate starts. Below is a photo of what Caju or the cashew fruit looks like. You can eat the fruit. You can also plant the cashew seed at the top and grow a cashew tree. Inside the seed is the nut. Click HERE to see a short video about cashew fruit. Caju - where cashews come from. Below is a photo of maracuja, or passion fruit. HERE is a cute video about sweet maracuja, which actually does look like a lemon. And HERE is a really cute video about how to make passion fruit juice. Hello all! It's Thursday already. The week is almost over and I cannot wait for this weekend. There is a food truck festival in my town and a Churro Festival in the next town over!! Yay!! So, in my post this past Monday I made mention that I had screwed up on some of my stamping. One of the phrases I stamped was crooked and the other phrase, because I stamped twice, looked out of focus. I started by (a) making a top folding A2 card base of white cardstock, (b) cutting a piece of designer paper using the large stitched rectangle from the Bundle of Stitched Shapes (Simon Says Stamp), (c) cutting another piece of designer paper using one of the dies from Stitched Rectangles (Retired, MFT Stamps), (d) stamping and cutting the words "Sending" and "Love" in red chalk ink from the Label Maker Sentiments set (MFT Stamps), and (e) cutting the image from Blossomy Condolences by Unity Stamp Co.
First step was to adhere the two pieces of designer paper to the card front. Next steps were to color the bouquet of flowers using a variety of Bic Markers. I then adhered it to the card front with some pop dots and I also adhered the two phrases, also with pop dots. The last things I did were to adhere some red sequins to the card front and apply some stickles to the leaves and parts of the flowers to give some shimmer. And the card is now complete. Labels: #stampinkpaperchallenge, Card, Stamp Ink Paper, Unity Stamp Co.
Hello again everyone. 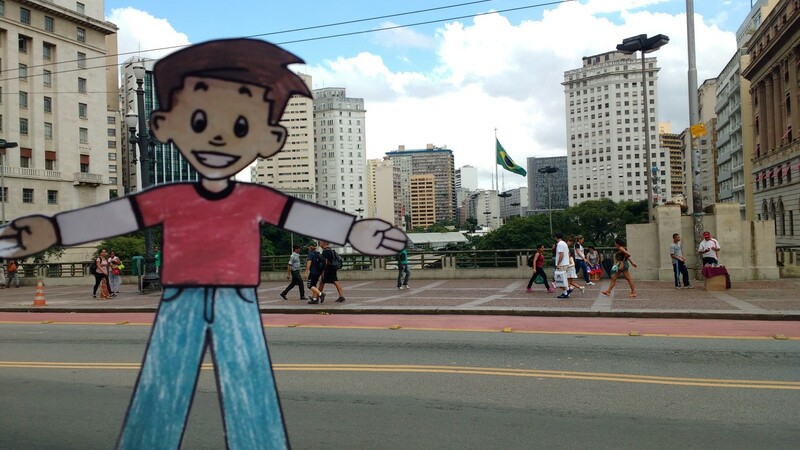 This is another post for my cousin Sami about Flat Stanley's adventures here in Brasil. This post is about the mini vacation we took with Flat down in Porto Alegre, Brasil. Porto Alegre is the capital and largest city of the state of Rio Grande do Sul. 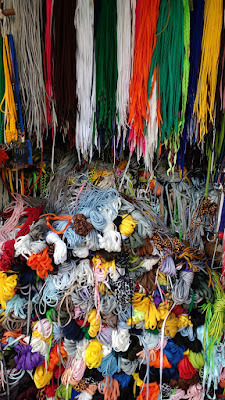 It was founded in 1769 by Manuel Sepúlveda and its population is about 1.5 million people. Although it is much smaller than São Paulo, Porto Alegre is the tenth most populous city in Brasil. 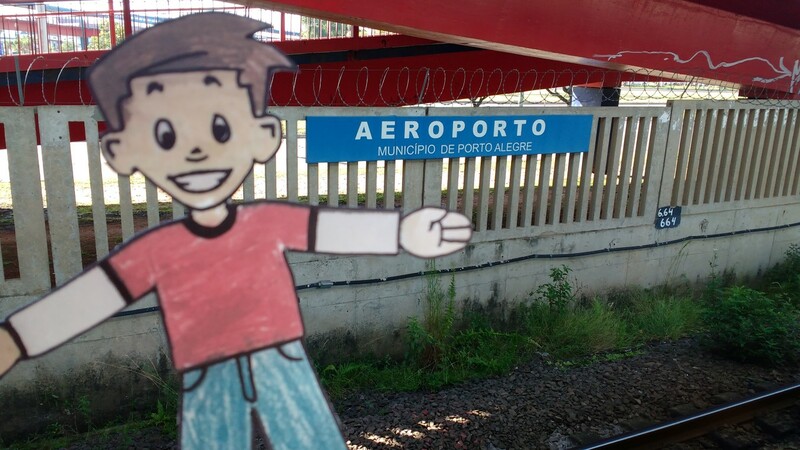 Porto Alegre is a really beautiful city with a lot of things to do and see but we only had a few days here. But we will be back (you have to say this in a terminator voice). The first place we visited was the Mercado Municipal, which means Public Market. The building is a landmark and was built in 1869. 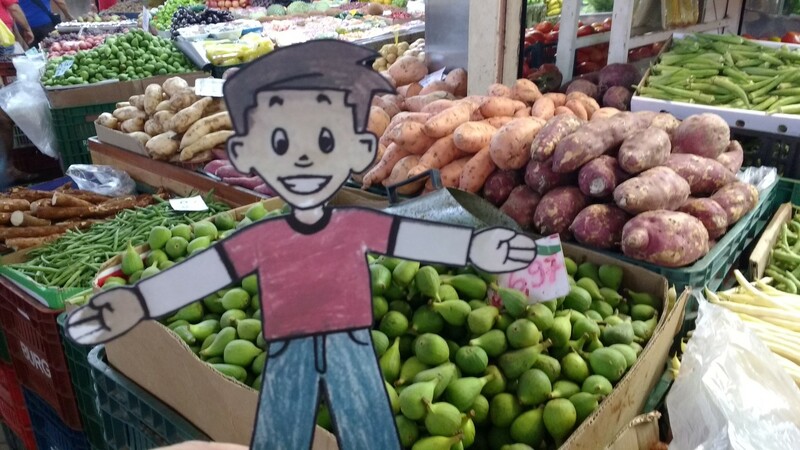 The market has over 100 vendors selling fruits, vegetables, meats, fish, crafts, snacks, plants, and lots of other cool stuff! 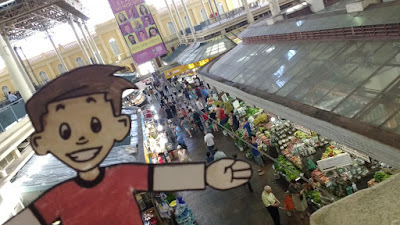 This is a cool video of Flat in the center of the market! 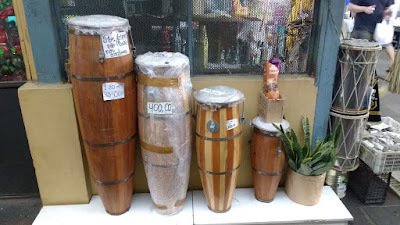 Here are some other photos of Flat in the market and all the cool stuff he found. 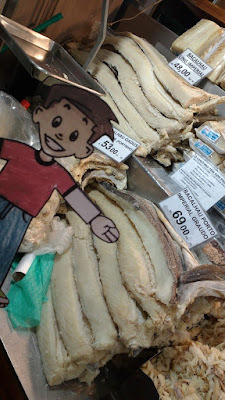 Flat found some really good bacalhau (ba-cal-yowe), which means cod fish!! YUM! Flat upstairs with a view to the main floor. Look at all those vendors!!! YAY!! 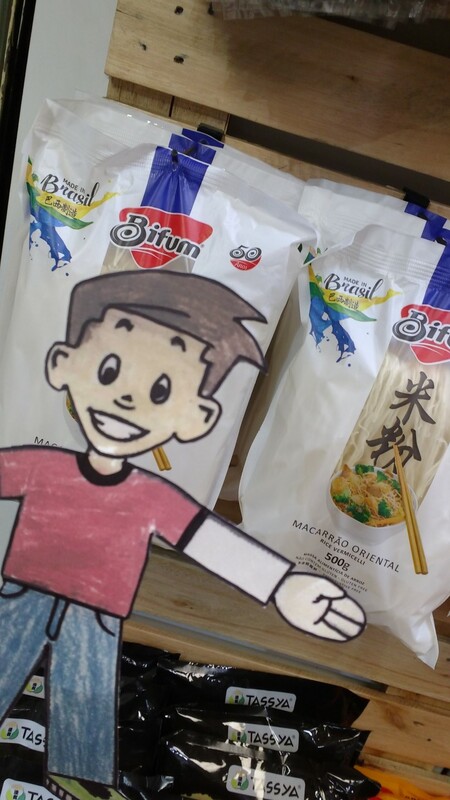 Flat found some sticky rice for Rachel, Sami's mommy!!! 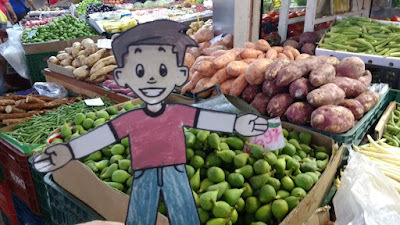 Flat had to buy some veggies because he likes to eat well! 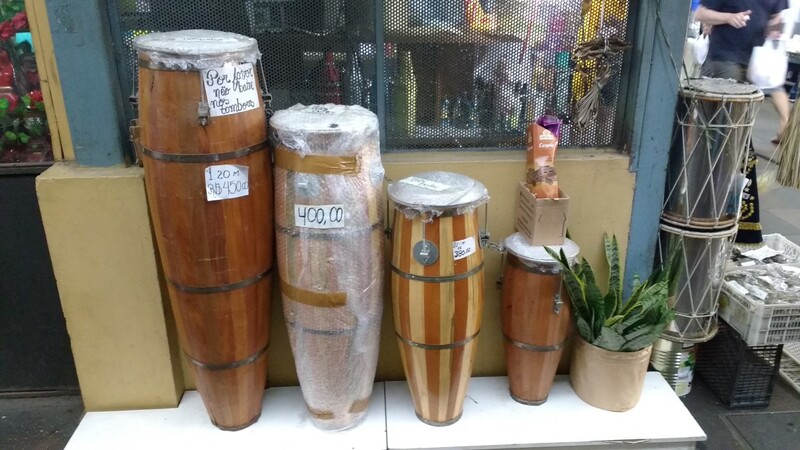 Flat even found some drums for Sami's Uncle David to play! After this we walked around the city. 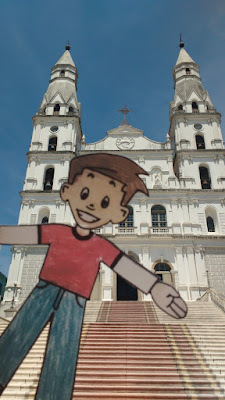 It was getting very hot when we stumbled on the Igreja Das Dores. 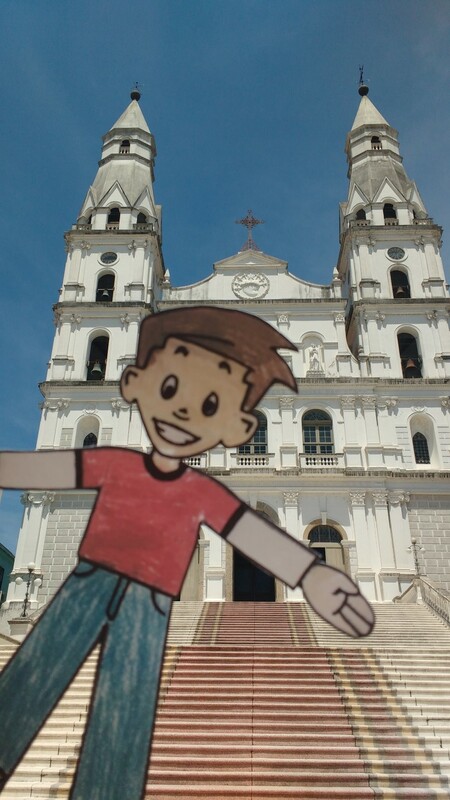 Igreja means Church in Portuguese. 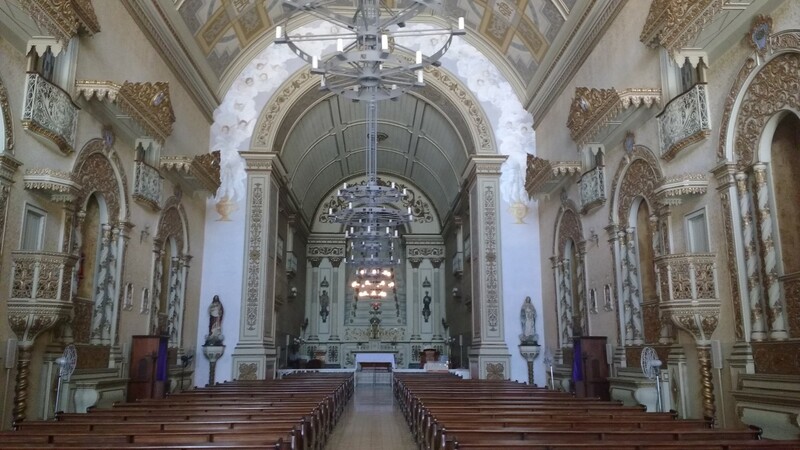 This is the oldest church in Porto Alegre. It was built between 1807 to 1904. That is a long time! Flat outside the Igreja das Dores. The inside of the Igreja das Dores. 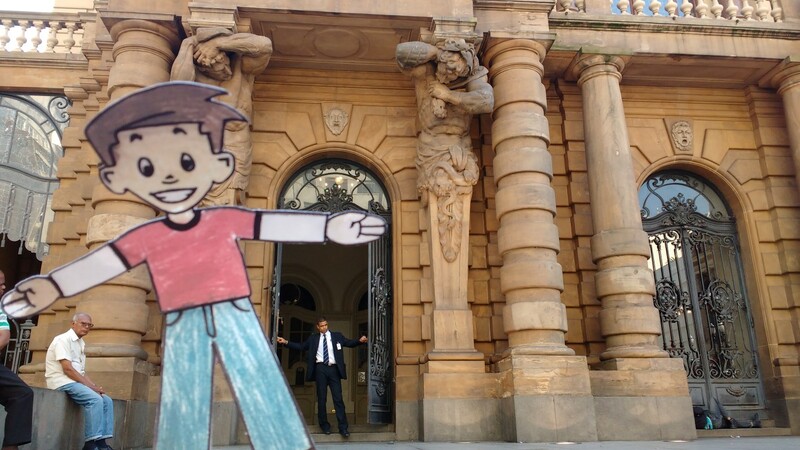 We left the church and then went to Mario Quintana Cultural Center. WOW! 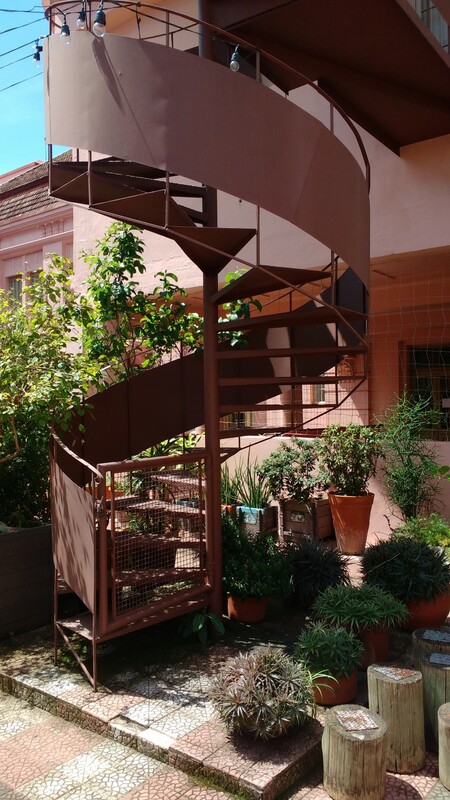 This is such a cool and interesting building. 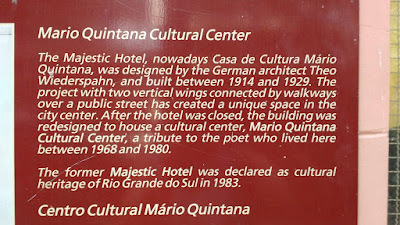 The building was originally a hotel called The Majestic Hotel. 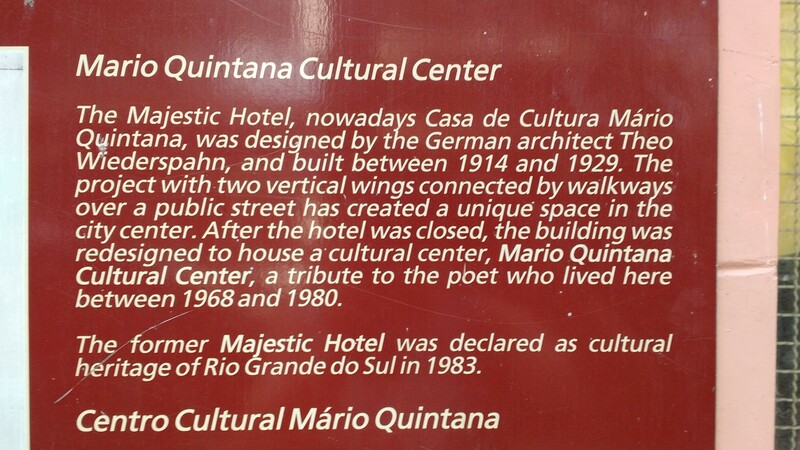 Mario Quintana was a Brasilian poet who lived in the hotel between 1968 to 1980. 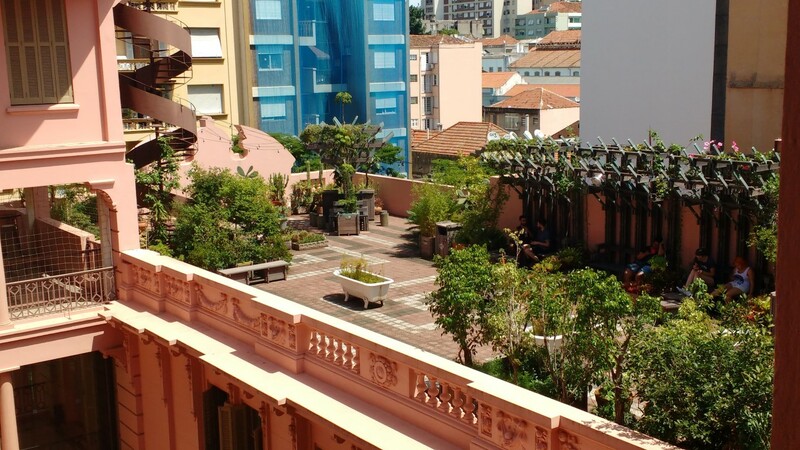 It is now a cultural center with a movie theater, a book store, and a beautiful garden and cafe on the roof. 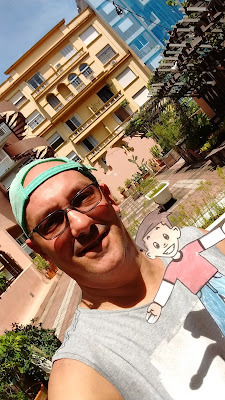 Flat with Cousin Michael on the roof garden. Yes...this is a bathtub filled with plants. 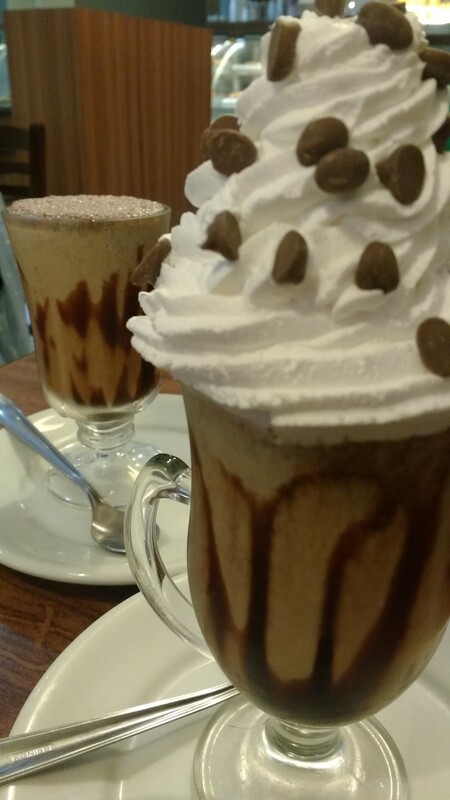 We were so tired we stopped to have some pastries and drinks. Flat wanted a beer but we told him NO! 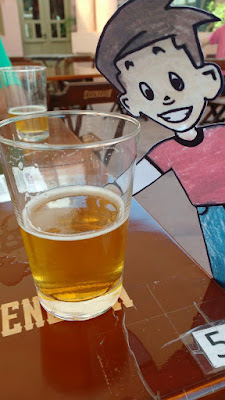 He is too young for a beer! Ice Cream Float for Flat! 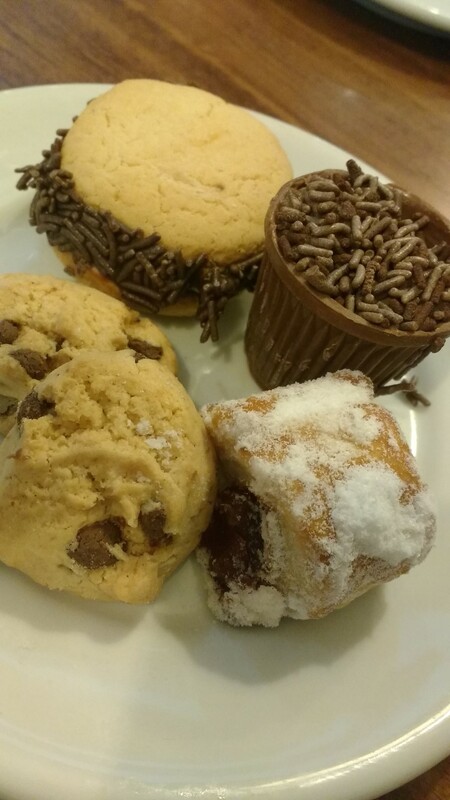 Brasilian pastries and cookies for me and Flat! YUM! What else did we find? Well, we found lots of cool old buildings. 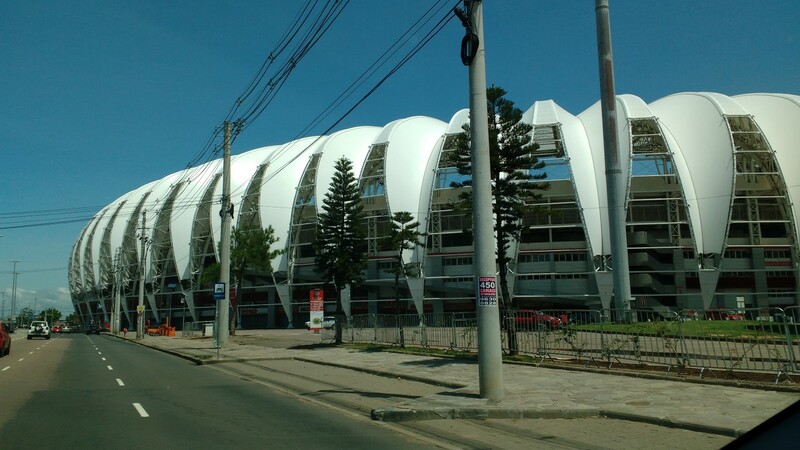 This is the Beira-Rio Stadium. Beira-Rio is the second biggest stadium in the Rio Grande do Sul state where lots and lots of soccer games are played. It was also one of the stadiums for the 2014 World Cup. 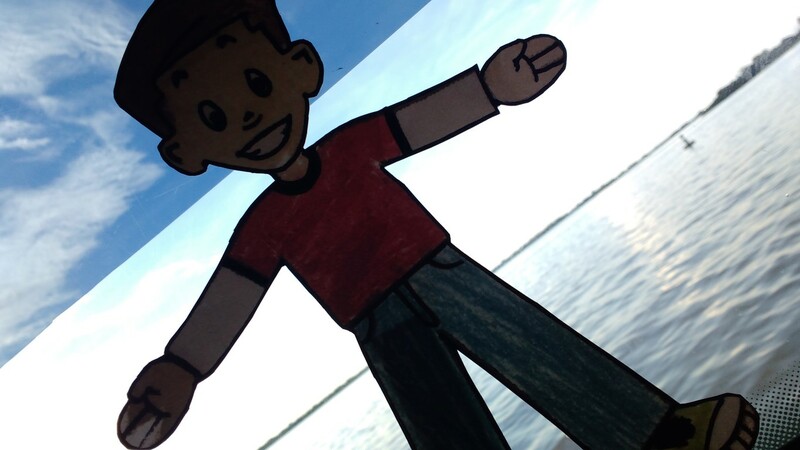 And, before we left, we took Flat on a ferry ride on the river so that he could see the sun set. And, when we were waiting in the airport to go home we had to get something to eat. 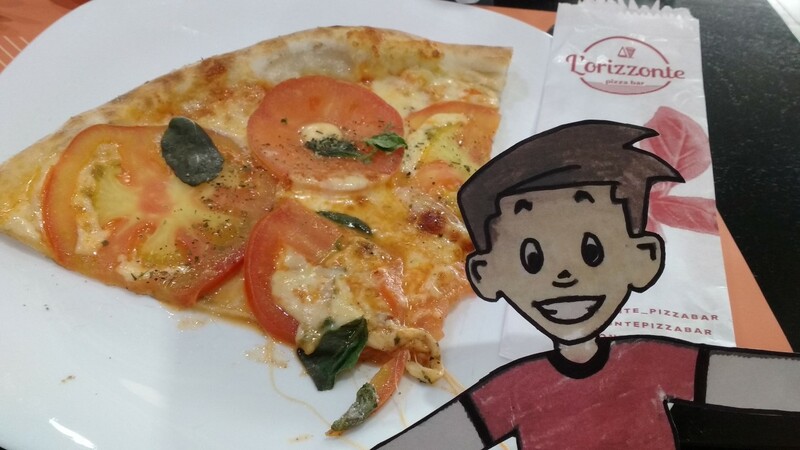 We found a pizza place and Flat said that it reminded him of pizza from New York City. It was sooooooooooooooooooooooo good! Flat hopes that you and your classmates enjoyed this trip to Porto Alegre, Brasil. Hello everyone. Just so you guys know, this is not a crafty post. I am doing a few posts for my cousin Sami who sent her friend Flat Stanley to visit me. 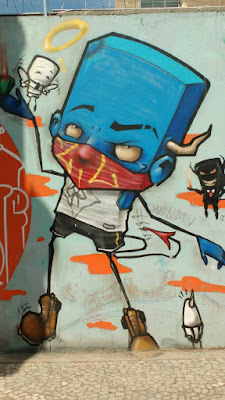 He got to know São Paulo, another city in the south called Porto Alegre, and interesting things in Brasil. So...Flat arrived. Safe and sound. With a lot of luggage. 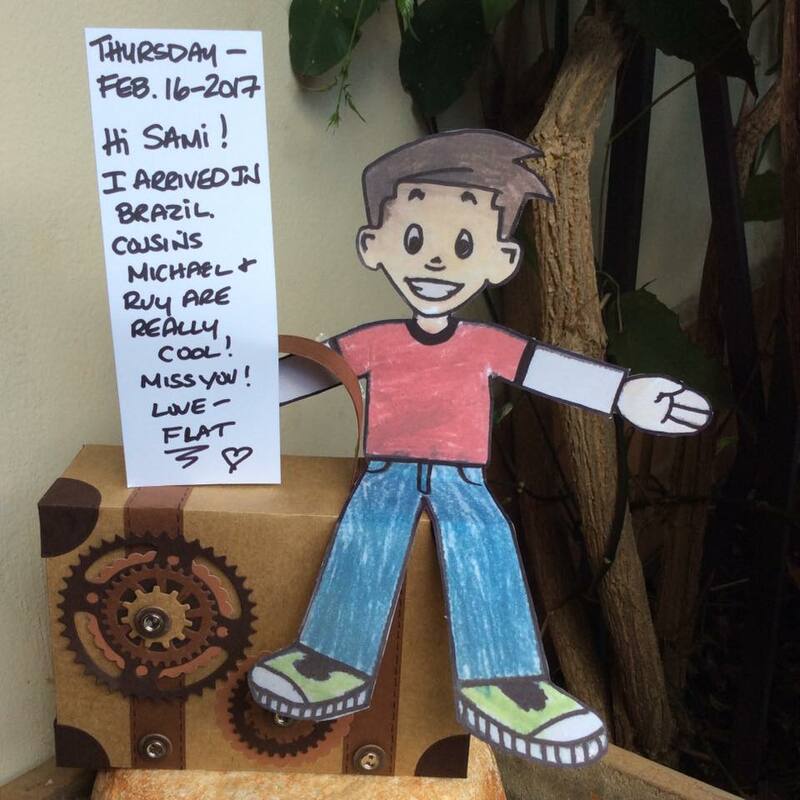 The first thing we made him do was to send a note to Sami letting her know that he arrived safe and sound! 2. São Paulo has the largest number of Japanese people outside of Japan! 3. São Paulo was founded on January 25, 1554. The USA was founded on July 4, 1776. 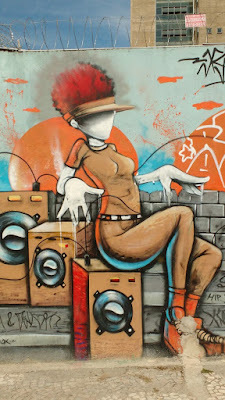 São Paulo is really really old!! 4. São Paulo has the 3rd largest amount of skyscrapers in the WORLD after New York City and Hong Kong. That is a lot of skyscrapers!!! 5. The São Paulo Aquarium has over 3,000 species of animals and fish and is one of the biggest in all of South America. That is a lot of animals to feed every day!! 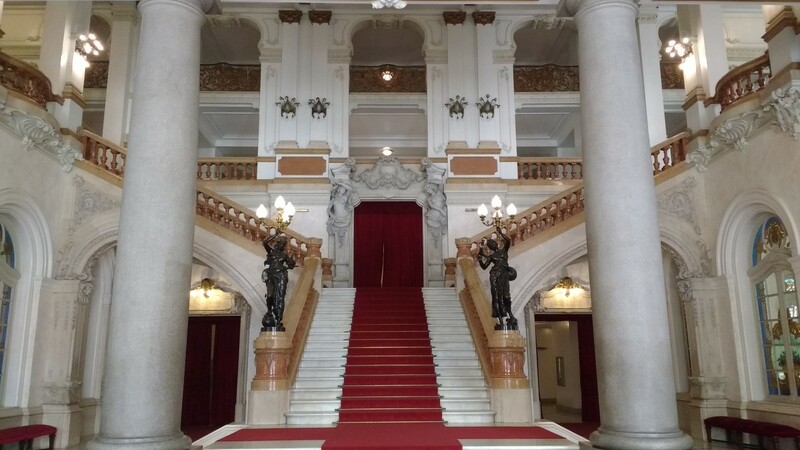 The first place we took Flat to was the Theatro Municipal (Theatre). 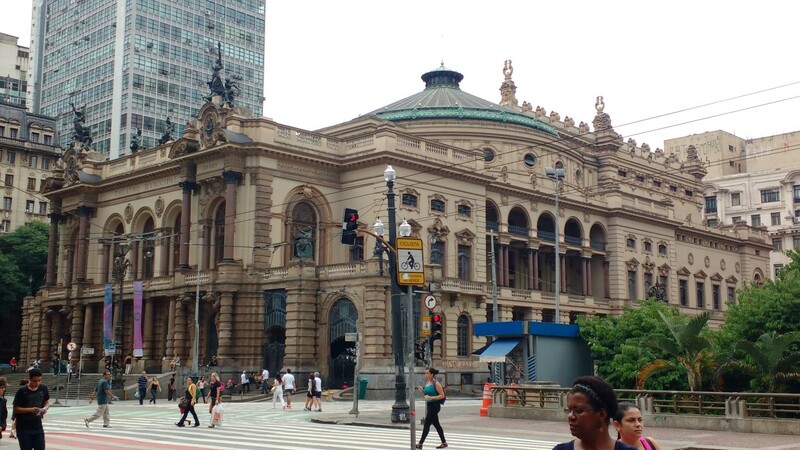 Construction started in 1903 and São Paulo gained one of the best venues in the world for the presentation of theatre productions, mainly operas. (Make sure you tell your mom about this one). 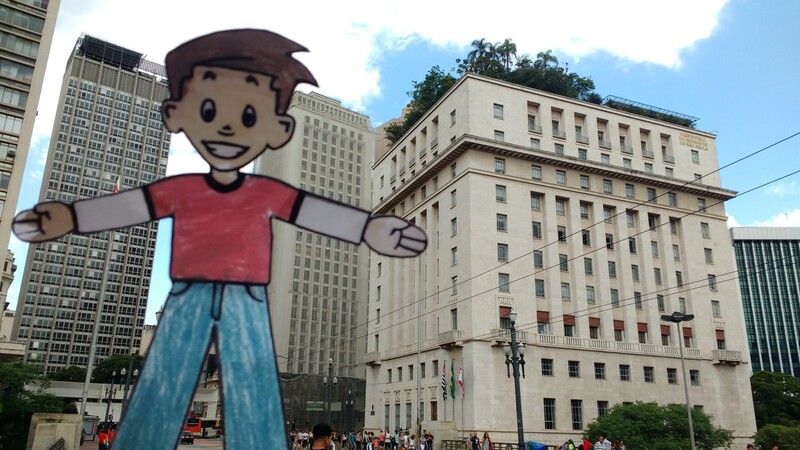 Flat Stanley in front of the Theatro Municipal in São Paulo, Brasil. 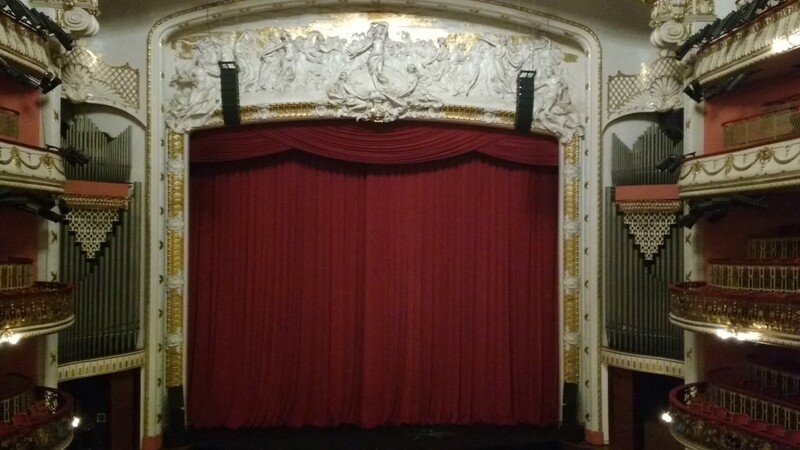 Now, I have been coming here since 2002 and never had the chance to see the inside of the Theatro. But I think Flat was good luck because we finally got to go on a tour and see the inside. Flat was too much in awe and did not want to take any photos inside. But here are a few for you (and your mom) to see. 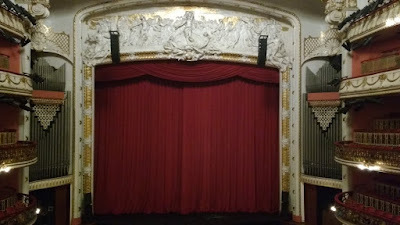 You can read more about the Theatro HERE, if you want. 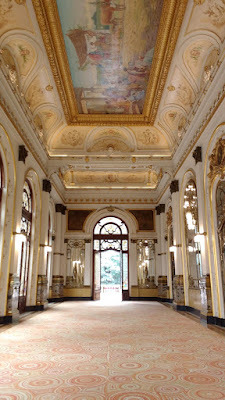 The inside foyer of the Theatro Municipal, São Paulo, Brasil. 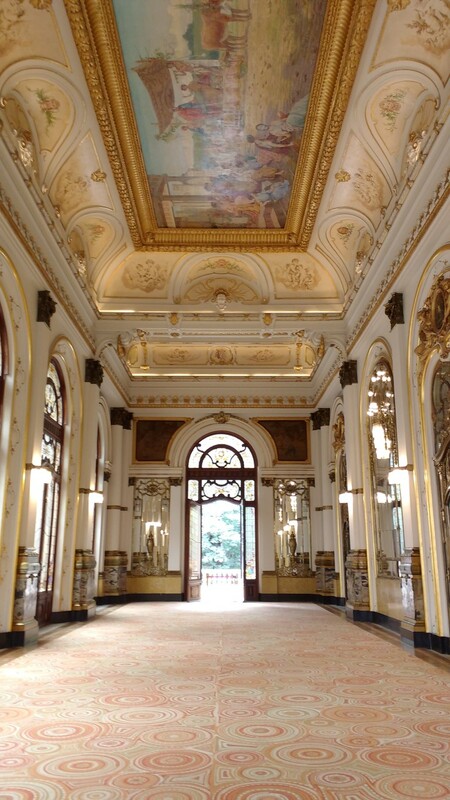 One of the Meeting Halls. 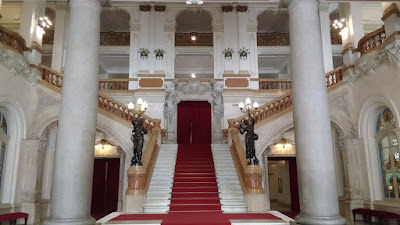 The whole Theatro Municipal from outside on the street. After the tour we walked around São Paulo a bit. Flat loved all the street art and the colors around the buildings and the street. In some countries street art is illegal. 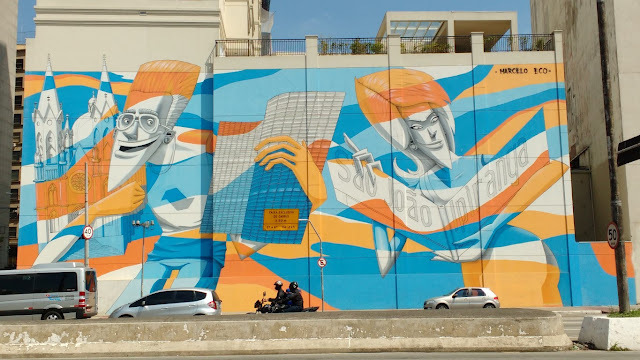 But here in São Paulo some of the best street art artists are allowed to paint beautiful and interesting art on the buildings. Here are some of his favorite photos. 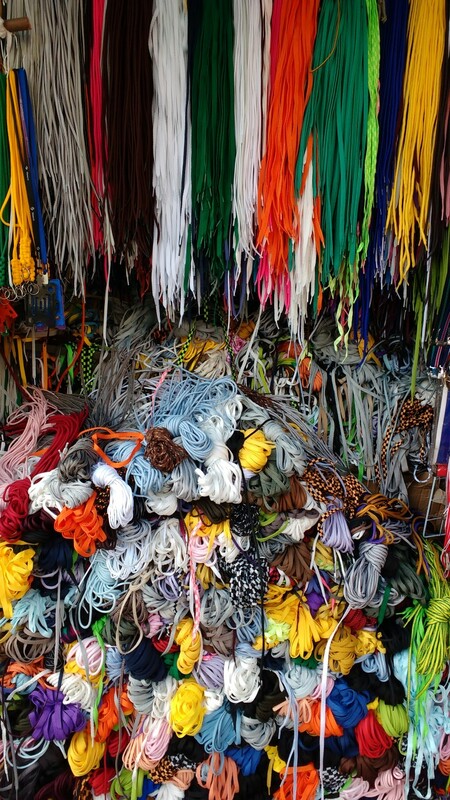 And this is a photo of a stand selling ONLY laces for sneakers! How crazy is that??? I had to buy Flat about 10 sets for his feet. Here are some more photos of Flat around São Paulo. Here is Flat in front of the São Paulo City Hall. It used to be a bank - many many many years ago - and has a huge garden on the roof. We wanted to go up to see it but it is being repaired. Here is Flat at the Shopping Light. This building, originally known as The Alexandre Mackenzie Building, was the headquarters of the company that used to distribute electricity in São Paulo. The building was completed in 1929. Since 1999, after careful restoration, it became a shopping center called Shopping Light. 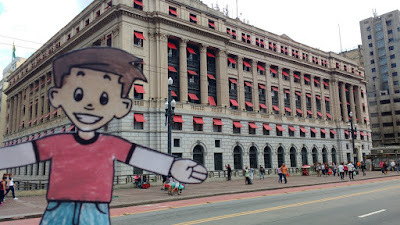 The Shopping Light mall is located across the street from the Theatro Municipal. And right next to the Theatro is a big park with lots of tall palm trees and places to sit and read a book and watch a concert. 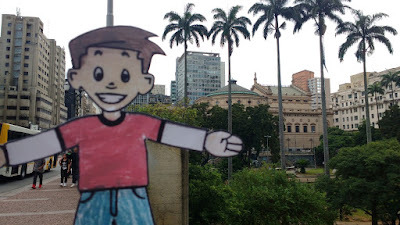 The park is called Praça Ramos de Azevedo. The word "praça" means "park" and Ramos de Azevedo was the Brazilian architect who designed the Teatro Municipal. the Praça Ramos de Azevedo. Flat in front of the Praça Ramos de Azevedo. 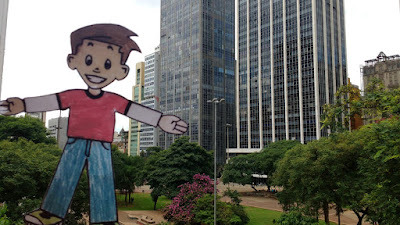 And finally, here is a photo of Flat with the São Paulo skyline behind him. 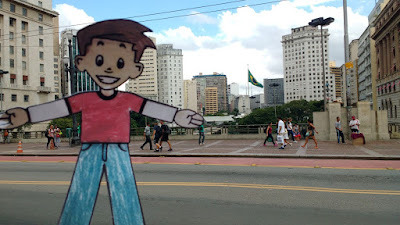 Can you see the big flag of Brasil flying behind him? Brasilians love their flag! I hope you liked this post and some history and photos of São Paulo. 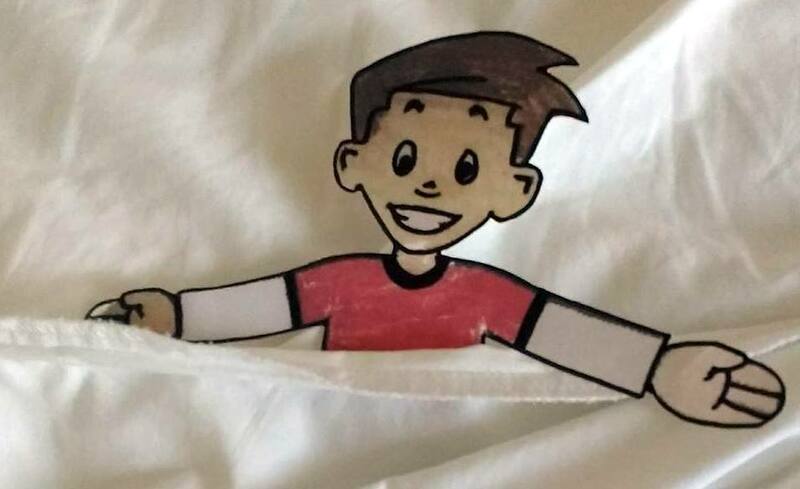 Flat misses you!!!!!! If you or your friends have any questions about São Paulo or Brasil ask your mom to email them to me and we will answer them for you.